In each of the following questions, drag the red and blue points on the sliders to express the required weight by the shaded area in the applet. Check the boxes to see how to calculate the weight. 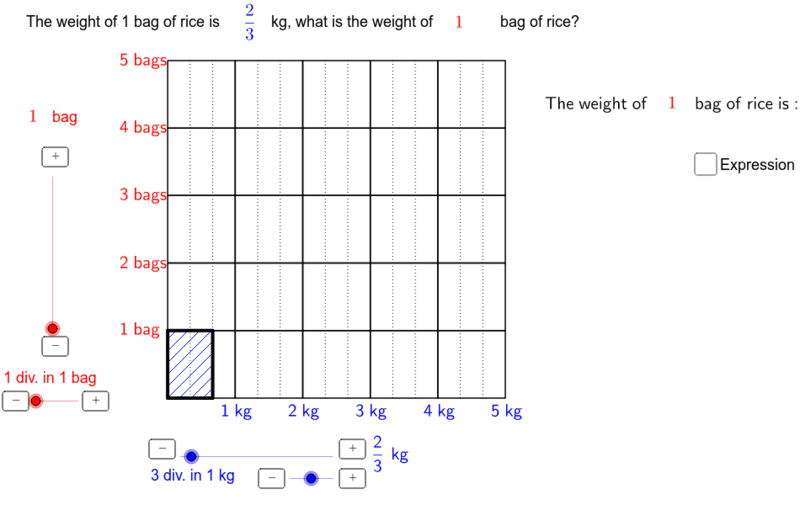 (a) The weight of 1 bag of rice is 2/3 kg, what is the weight of 4 bags of rice? How to calculate 2/3 × 4? (b) The weight of 1 bag of rice is 4 kg, what is the weight of 2/3 bag of rice? How to calculate 4 × 2/3 ? (c) The weight of 1 bag of rice is 4 kg, what is the weight of 1⅓ bags of rice? How to calculate 4 ×1⅓ ? (d) The weight of 1 bag of rice is 4/5 kg, what is the weight of 2/3 bags of rice? How to calculate 4/5 × 2/3 ? (e) The weight of 1 bag of rice is 1¾ kg, what is the weight of 2⅔ bags of rice? How to calculate 1¾ × 2⅔ ? Anthony C.M. Or. GeoGebra Institute of Hong Kong.